Has a time machine gripped the West Midlands? It certainly seems so. For not only did Elvis Presley ‘play’ the NEC last month (via a giant video screen), but 70’s pop star David Essex is in Wolverhampton all this week, and last night so were The Osmonds . . . well, three of them anyway. Jay, Merrill and Jimmy were due to have been joined by brother Wayne until he suffered a stroke just prior to the tour.
. . . although the Civic security staff at the front of the stage seemed to be the only ones there without a party invite, constantly thwarting the band’s efforts to get – as the tour was called – ‘up close and personal’ with their fans. Still there was no arguing with the rock credentials of opener Crazy Horses, Jimmy’s ‘keytar’ spouting sparks at the end. Talking of rock credentials, brother Jay looked like he was auditioning for Metallica during a quite spectacular and unexpected drum solo. The largely female audience danced and sang along with hits including Let Me In, Going Home, One Bad Apple, He Ain’t Heavy He’s My Brother and, of course, Love Me For A Reason. Along with a nice line in self-deprecating humour, The Osmonds have still got the boy band moves after all these years (let’s face it, they invented most of them four decades ago), and, as they showed in a couple of barbershop harmony routines, the vocal sounds to back that up. 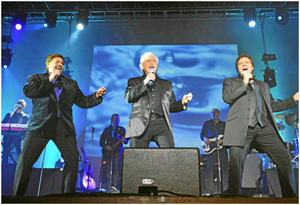 Three tracks from The Osmonds’ latest album, Can’t Get There Without You, showed a Take That-style approach. But how many of today’s boy band wonders will still be packing them in in 2052, I wonder?